Expedia has been helping travelers revel in the glory of planning a bargain vacation since 1996. The company keeps in touch with hotels, airlines, car rental agencies, cruise companies and other hospitality related businesses in over 22 countries throughout the world, and gets them to offer discounts to travelers who book through the Expedia website. There are numerous ways to get a good deal using the Expedia website. Deals can be found à la carte, or savvy travelers can bundle their reservation for a greater value. All deals include a Best Price Guarantee. Visitors to the site simply enter a destination, desired reservation dates and the number of travelers to get instant access to hundreds of hotel listings with verified prices for the location. Then, they can pare down results by choosing filters, like “Pet Friendly” or “Green Sustainable.” Results can also be slimmed down by choosing a budget, star rating, property type, amenities and dining options. Expedia also works with the top twelve car rental services. Customers can choose from economy, compact, midsize, standard, full-size or premium automobiles, and results can be sorted by price, rental company and features. 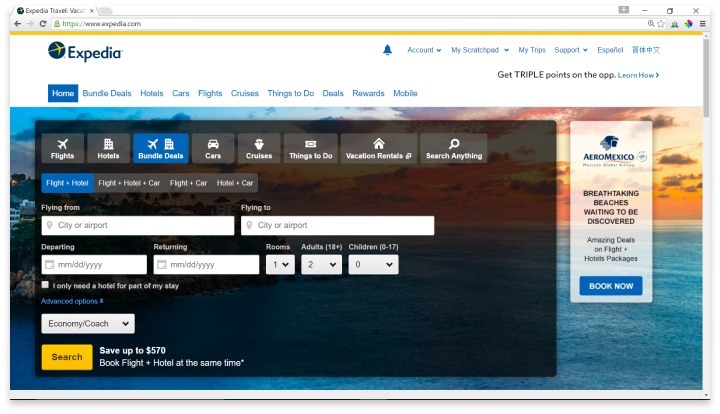 The Flights section of Expedia allows consumers to choose from roundtrip, one way or multiple destination bookings. Once all the unique trip information is entered into the search engine, a list featuring hundreds of available flights pops up. Expedia will also give tips on nearby dates that could save the flexible traveler extra money. Most of the major airlines advertise their flights with Expedia, which allows loyal customers to save money while sticking to their usual airline. Expedia cruises sail through waters around the world, and feature all the most popular, and even some less popular, destinations can be booked on various cruise lines. Some trips on the sea that are booked through Expedia include bonuses like onboard credit. One of the more exciting features on Expedia is the Things to Do section. This section can turn any trip into a true adventure. All the vacation planner has to do is type in a destination and dates, and they’ll get access to reduced price tickets to nearby amusement parks, zoos, museums, day trips, activities, tours, and more. This section of the website is a dream for planners who like to have a fixed itinerary before their feet hit the ground. Expedia offers other ways to save money, like Daily Deals for up to 40% off, or last-minute deals on spontaneous getaways. They also have a membership club called Expedia+. Members gain access to exclusive pricing and deals, plus rewards that can be redeemed on travel, along with perks like room upgrades at certain levels. Last, but not least, Expedia’s Price Match Guarantee allows consumers to book without worry. If a better price comes along within 24 hours of booking, Expedia will give the consumer an extra $50 back. In many cases, Expedia can save the consumer money, but there are many reports of Expedia customers arriving at their destinations to find out their hotel reservations didn’t exist, or that their room had been double booked. To avoid this, consumers should always confirm their reservation with the hotel. When considering this information, it’s important to remember how many travelers Expedia serves in comparison to how many instances this happens, which is to say, it’s a small percentage. Also, miscommunications are more bound to happen through third-party sites, as they essentially act as a middleman. Having a middleman involved in travel plans can also lead to other issues. It will be harder to make any changes to reservations after they are booked. It also means the consumer should do a little extra research before finalizing the booking in order to ensure the hotel, airline, cruise line, car rental company or business is up to their standards. Expedia helps travelers get great discounts with hotels, airlines, car rental agencies, cruise companies and other hospitality related businesses in over 22 countries. Expedia is a travel aggregate site that helps travelers get good deals, but the consumer must do their due diligence to ensure they get what they pay for. Booking through the site is easy, and can save the customer a ton of time spent researching, but they should still check out any business they plan on making a reservation with. Also, the customer should call the business directly to confirm the reservation. Have you had an experience with this company? Please share your Expedia reviews below.